We have gained expertise in manufacturing and supplying high quality Metal Bin Box. These boxes are made in consonance with the international quality standards and norms, utilizing high-grade metal and advanced techniques. Furthermore, our products are checked for their proper finishing by knowledgeable professionals, with an aim to attain utmost contentment of the patrons. 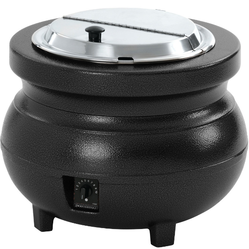 We are one of the leading manufacturers, exporters and suppliers of Electrical Soup Pot Station. Assisted by a qualified workforce and advanced manufacturing unit, we are engaged in offering a wide range of Electric Salamander. The offered salamandar is made available in different sizes having diverse capacities. From 2 to 3 pieces set is made available by us to the clients. There are a variety of designs provided with salamandar. Also, provided salamandar is made adhering to industry quality norms. Besides, clients can get the salamandar from us at industry leading rates. 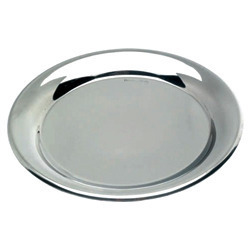 As an affluent name of this domain, we hold expertise in presenting high quality Round Platters. These platters are widely demanded due to its elegant look and high capacities. The provided platters are designed and manufactured by engineers using utmost grade stainless steel materials, and steel alloy with the aid of cutting-edge techniques. The offered platters keep the food fresh for long hours. Besides, clients can get the platters from us at industry leading rates. 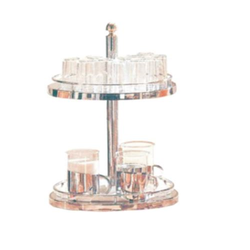 We are also instrumental in manufacturing and supplying Revolving Glass Stand. We feel proud to introduce ourselves as the leading organization in this domain, engaged in presenting an excellent grade of Ice Cream Dispenser. 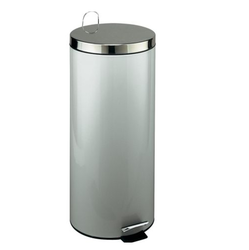 The offered dispenser is largely used in for carrying ice water and cream by the eateries, restaurants and hotels. Travelers going on short journeys prefer using the dispenser due to its capacity, which is 1.1L to 15L. Provided dispenser is designed and manufactured by adroit professionals using premium grade material with the aid of sophisticated techniques. Backed by our years of industry experience, we are betrothed in presenting an excellent quality of Oval Curry Dish. 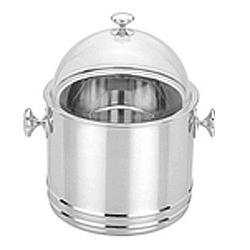 The offered dish is made available in different sizes having diverse 1L, 1.5L 1.8L capacities. 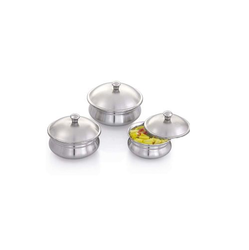 The offered dish is attached with a small clip and lid grip for carrying effortlessly. There are a variety of designs provided with the dish. Also, provided dish is made adhering to industry quality norms. Besides, clients can get the dish from us at industry leading rates. We, at Chheda Industries are engaged in the manufacturing, wholesaling and exporting of world class Stainless Steel Buffet Ware, Breakfast Buffet, Chafing Dish, Lid Chafing Dish, Round Chafing Dish, Glass Led FlatWare, Display ware, Kitchen Equipment and many more products since 1967. We are deal in our own company name as brand name that is chheda. We also take turn key project to suit different type of clients. We welcome queries for Kitchenware Products from Overseas Countries like United Kingdom, United States, Australia, China, Denmark, France, Netherlands, New Zealand & Norway. We are happy to share that many of our products has won best designing awards in international trade fair and brought us appreciation with huge orders year after year. 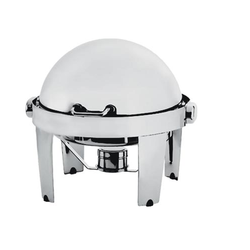 Among the manufacturer in India we have upper edge towards producing widest range of chafing dish and other products in various finishes with international standard.